Indiana officially has two state flags because even after adopting the new flag in 1955, the law of 1901 adopting the Stars and Stripes was never repealed. The flag features Paul Hadley's design which won the state flag competition run by the Daughters of the American Revolution. Flag features yellow on a blue field with the Liberty Torch in the center. Thirteen stars representing the original states outline the design, while the five stars in the inner circle representthe next five states admitted. Atop the torch is a larger star with the name Indiana above it. Choose from outdoor or indoor flags from Tuff Flags that are made to precision and quality. Made from premium quality materials and finished with grommets and headings, our flags are a visual delight and are made to last for a very long time. Made in USA, all our flags enjoy 6 months guarantee on construction. Shop from our complete line of Indiana Flags right away and avail the best prices, quick shipping and much more! 100% customer satisfaction guaranteed! Tuff Flags offer a complete line of finely crafted Indiana flags that are perfect to celebrate your state pride in style. Choose from 200 Denier Nylon or 2 ply Polyester materials in outdoor flags that are designed for the rigorous conditions of the outdoors. Offered in various popular sizes that range from 3’x5’, 4’x6’, 5’x8’ 6’x10’ and 8’x12’, these industrial grade flags make perfect choices as daily use flags for offices and homes. 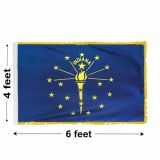 Our nylon indoor Indiana flags are offered in both plain and gold fringed models. 100% made in USA, these flags are composed of 200 Denier nylon and finished with pole hem and leather tab that are great for indoor flag displays and parades. Need something that is easy to set up? 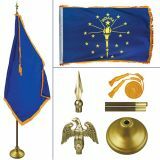 Look no further than our indoor flag kit that includes everything including poles, ornaments, tassels and more. 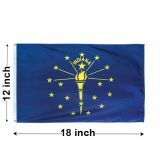 See how your guests will be awe struck with these perfect indoor flag displays!Browse our selection of Indiana Flags and choose a model that matches your needs. Not sure what you need? Call us at our toll free number (888) 287-3524 or email us at customercare@tuffflags.com and we can help you make the correct choice.